Professional heavy transport, across Australia. Premium heavy haulage and oversize load transporters. Hevi Haul is a comprehensive heavy haulage transport service provider, offering city-wide and interstate transport solutions for companies requiring specialised transportation. 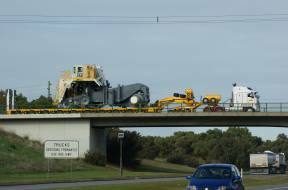 Since 1999, we have been assisting clients across Australia with all their heavy haulage needs. Look no further for complete Australian heavy logistics services; we have what you require. Certified and accredited, we operate a fleet of prime movers, wide floats, and a long float with capacity up to 190 tonnes. For those overload shipments that exceed even our largest float, we utilise the services of a select group of skilled sub-contractors, who are highly experienced and trained to handle oversize loads for interstate transport. As one of the most specialised heavy haulage transport companies countrywide, we have considerable experience in moving heavy loads between the west and east coasts. Transport your oversized equipment or shipments with us and you are guaranteed a full logistics service. Our many solutions include traffic management, police escorts and more. The Hevi Haul in-house team deals with road closure, permits, and road surveys beforehand to determine bridge heights and how best to tackle obstacles along the route. Heavy haulage transport across the interstate requires legal authorisation and licensing to ensure your shipment gets to its destination on time and with all the required documentation, and we take care of that. Hevi Haul operates under the strict Australian transport guidelines and our drivers are fully licensed and compliant with oversize load regulations to provide the best interstate transport services. We put safety and customer service at the top of our list, which is why your turnkey heavy haulage transport is a cinch for us. Our comprehensive fleet of floats can carry up to 190 tonnes, and for those particularly long and wide shipments, we have flat tops to accommodate shipments of a large design. We ensure road clearance, route surveys, and customs clearances (when required) are completed. If you require machinery interstate transport to the other side of the country, or simply across the city, Hevi Haul specialists are here to assist you. We have well-maintained low loaders for large-scale construction machinery such as bulldozers and more. We will handle the job from start to finish. Our team will collect your oversize load, transport and deliver it to your stated destination, with our project managers and drivers providing premium logistical and transit services. Heavy haulage transport requires project management to ensure safety, efficiency and punctuality. We have a team who will map out the most cost-effective and safest route, organise road closures and travelling documentation. Ensure safe, affordable and professional countrywide interstate transport, by contacting us today.